Remarketing: should you do it? Well first, what is Remarketing? Here is a screenshot of a real-life situation as it actually happened to me (click to enlarge). I wanted to read-up on Ebola because it came up in a conversation and I had no real knowledge about it. I had only heard bits and pieces in the “news” (which explains why I knew nothing substantial about it) and therefore could add nothing to the conversation. 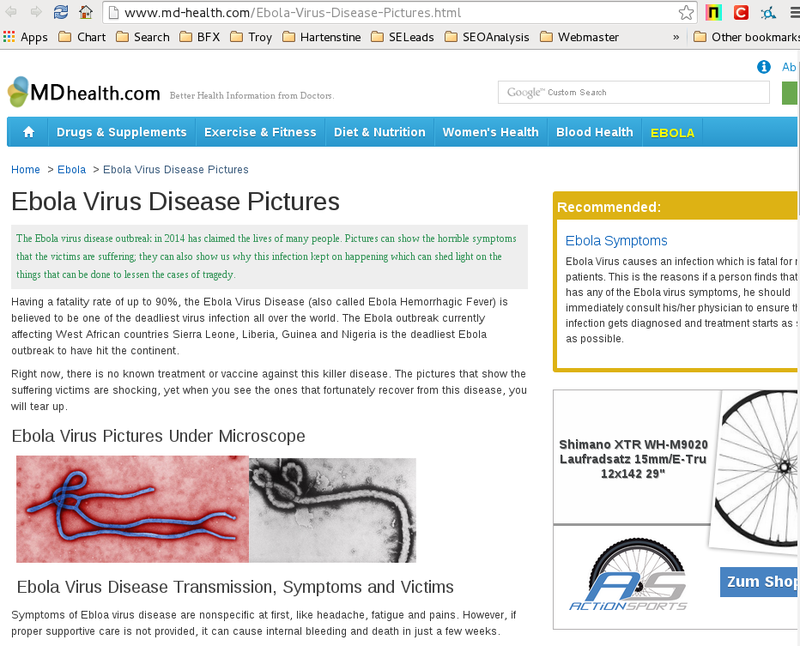 I later Googled “ebola”, and clicked on md-health website. Suddenly I notice this ad from a bike shop on the right. What the heck does a bike shop have to do with ebola? That’s Remarketing. Bookmark this concept ==> the ad is not relevant to what I’m doing right now! It’s an interruption – similar to ads on TV – which means this ad has low conversion potential to start with. I had recently been searching online for a particular bike part that I could not find locally. I had visited that very bike shop website; one of many bike shop websites. That website placed a cookie on my computer (in the browser). It happens that Md-health places Google ads on their website to make money on visitors like me (you can do the same with Google Ad-Sense). So think of Remarketing as advertising that “follows you around” online, kind of a “reminder” ad. So now that you know how this works, and you will begin to recognize the ads you see on other website as Remarketing, you can judge if it has an influence on your behavior. I have found that Remarketing ads have never caused me to act (click). If I search for something to purchase online, I usually buy it, or look up the address where I’m going to physically buy it – done – I’m now offline – and no longer a potential customer for the Remarketing approach. But should you do Remarketing? You can answer that question precisely only if you have a strictly online business. Unfortunately, if you are like most local businesses, you have walk-in customers, or take telephone calls to complete sales. In that case you cannot measure if those Remarketing ads are leading to sales. Yes you can spend more money on clicks ( just as you normally do with your Google Adwords campaign) but you still can’t see if the any of your ads turn into sales. So don’t let your PPC advisor tell you Remarketing is proven to increase sales. That has never been proven for local businesses. Bottom line ==> You can probably prove that more ad spending will lead to more sales. Now that is Rocket Science at work! Products with long purchase cycles ==> such as automobiles, can benefit by repeatedly exposing your business name to customers who have already visited your website while shopping online. In this case you are building brand awareness, often without paying for clicks. Chances are the brand(s) you sell are already engaged in Remarketing at a global or national level. Its what they do, and they can do brand advertising more effectively than a local business. Remarketing may be best for Brand awareness ==> a local business’s brand is really it’s name ==> Remarketing ads using your business name may make sense – but Remarketing product oriented ads may not be so effective. I have found that most ( actually all – as in 100% ) Remarketing ads I have sampled out of professional interest are implemented poorly. The bike shop ad in this example, linked to a completely different product page than anything I was interested in. So while I clicked because the keyword “XTR” was visible ( part of my search term ), I was disappointed to NOT FIND something even remotely relevant on the landing page – so I’m out-a-there. The bike shop just wasted money because they setup their keyword attributes very broadly and did not have appropriate landing pages. ==> Poor landing pages and appropriate keyword attribute settings are common weaknesses for most ordinary Pay-Per-Click advertising campaigns everywhere. If you’re not doing the basics well, reaching harder and farther with Remarketing is like trying to run before you can walk. If you have absolutely mastered your PPC advertising, then Remarketing is a worthwhile experiment. But its not for the pay-per-click beginner, and its not for products with impulse buys or short purchase cycles ( like bike parts ). Having good (specials) product pages, and getting more 5 star reviews will increase conversion and sales for a lot less spend than Remarketing. That advice may seem unrelated to the topic, but conversion into sales is going to happen because the customer chose your physical store front over the many others they visited online because they liked what they saw the first time, not because they saw the same ad over and over again.